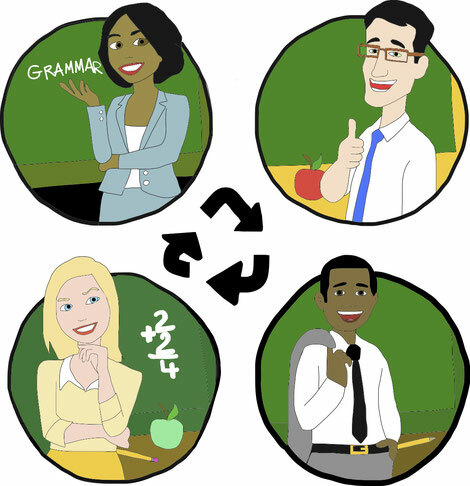 At Dave and Amy English School, we rotate teachers every 4 months. We think we have the perfect balance between the benefits of changing teachers and the disadvantages of changing teachers too frequently. We have 7 dedicated teachers (including Dave and Amy) who have been with us for years. So, when we rotate teachers, the students are not getting a new teacher, they are reuniting with a teacher who has previously taught them. This contrasts with schools that have to change due to high teacher turn-over. (our teacher retention is one of our major selling points). * Kids avoid getting bored with the same teacher. And let’s be honest, the teacher might get bored of the kids! * Even though we all follow the same curriculum, the new teacher brings a new style, a different accent, a different sense of humor…. * Children without a variety of teachers will possibly grow dependent on that teacher’s accent, teaching style, vocabulary. Teacher variety helps children become more adaptable. * The student / teacher relationship can be harmonious but also sometimes fractious. A new teacher can come in and resolve these issues by giving every child a fresh start. * Teachers enjoy seeing students they haven’t taught for a while and remarking on the progress they have made. For example, I will have a class learning single letters who are struggling. When I return to teach the class 4 months later, they can all read 3 letter words. Also, seeing students who you have taught since they were kindergarteners enter the room as young teenage men with facial hair, taller than myself…… is disconcerting but also very rewarding. * Students also look forward to re-seeing a teacher from a year ago. If your teachers are all well trained, experienced and follow the school philosophy, the change should be seamless. We get NO complaints. In fact, the students and parents look forward to the rotation as much as we do. If you are able to do the same at your school, we highly recommend it. Even if you are the solo teacher at your school, we recommend finding a way to change teachers (swap with another solo teacher in your area / hire another teacher occasionally….). As a final note, I would like to point out that before we hired our first teacher, we were worried about having NEW teachers. But as long as you have long term, dedicated teaches, please do not be afraid. Different teachers with different styles, accents, senses of humor——- as long as they are dedicated—— only make a school and its students stronger. To add: it’s well known that soccer teams improve with a new coach. It’s the same with English. Students improve with the new teacher with every change.